This year we stole California's snow. Our snowpack is well above average and people are fearing a repeat of the 2011 flooding on the Missouri and Mississippi Rivers. The high run-off creates some problems in Montana, but the major problems are downstream as converging streams and rivers from Montana, Wyoming and Colorado overload the larger rivers. We have suffered a small amount of damage in early March when warm weather and rain followed a heavy snow. The run-off ate away the edge of the driveway on the lower portion and probably deposited a lot of mud in the drainage culverts. We will have to do some major repairs this Summer. There are two big dogs in the pictures that follow. Rosie graduated from Puppy Class at PetSmart in Bozeman, following in the footsteps of Neko and Pumpkin. Of course, she was a star pupil. 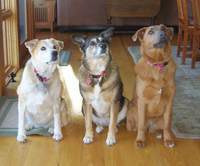 Being a little older and a calmer breed than the others was a big help. 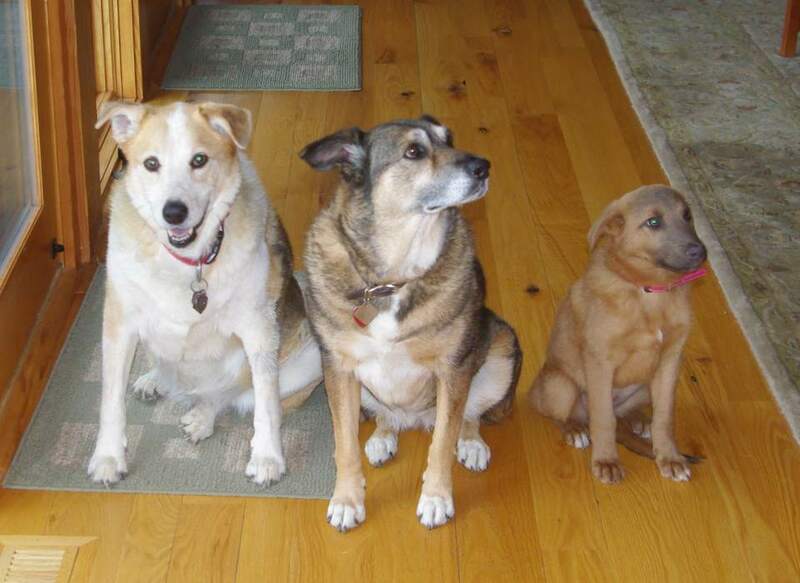 As she gets older, Rosie is taking on many characteristics of a Chesapeake Bay Retriever or Irish Setter rather than those of the German Shepard and Border Collie we were told were in her ancestry. The MSU Wildlife Techniques (WILD 373) course we hosted several years ago was offered again this year and they again took advantage of our convenient location to do field work. The elk have been hanging around our property a lot this Winter because of deep snows driving them to the easier food here. The elk attract predators, so there was hope of getting interesting pictures – probably coyotes or a mountain lion (it was too early for bears). It was a mild surprise when one of the cameras caught a wolf on the prowl. We have many coyotes in the area and they are often mistaken for wolves, but the identifying features are clear. Besides, the professor and many of his graduate students have done extensive research on the role of wolves in Yellowstone Park, so they know a wolf when they see one. There have been reliable sightings by our immediate neighbors in Bridger Canyon in 2008 and 2005, but this may be the first pictorial evidence of one in the past decade or so. See more wolf pictures here. We are still hoping for a picture of a mountain lion; we know they are around. An interesting phenomenon in late Winter and early Spring is the appearance of the Snow Flea. They make the snow appear to be covered with fine-ground pepper. Here, they have not “swarmed” onto our patio; they have been blown by the wind and formed a drift behind one of the timber pillars. They are not actually fleas and are a beneficial part of the ecosystem. Rosie is now 7½ months old and has tripled in size since we got her at 3 months of age. The Rez Dog people called her “scaredy dog” because she was so shy. When we first brought her home she would run and hide in her crate if anyone came to visit. She is still a bit shy, but does enjoy having visitors. Even though she is now the biggest dog, she still thinks Neko is boss and Pumpkin is second in command. Meanwhile, Neko has lasted much longer than even the vet thinks possible. The local police reports are often more entertaining than the comics. Check these out.